Robin Marantz Henig. Houghton Mifflin, Boston, 2000. Here is the book many biology teachers have been searching for, a short life of Mendel that gets it right. Henig has crafted a richly detailed narrative that fully evokes Mendels life and work. Her biography draws largely on reliable published sources. What she adds is a journalists flair for story telling, making the now-famous story of the forgotten monk come to vivid life. The first half of her book is more-or-les a history of Mendels life, from his childhood in a farming family in what is now the Czech Republic, through his education at the University of Vienna, to his years of growing peas in an Augustinian monastery in the city of Brno. In 1865 Mendel summarized his work at a meeting of the local natural history society and published a long report in the societys journal. The precision and simplicity of Mendels report are startlingly modern. Mendel sent a few dozen copies of his report to scientists, but his work went largely unnoticed. The Monk in the Garden is two books in one. Henigs second effort is to describe the rediscovery of Mendels work and the birth of Mendelism. She does a fine job, although her lack of biological training shows through. 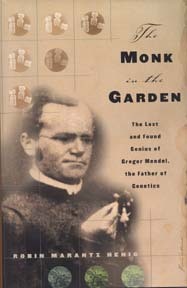 In her biography of Mendel she fails to take into account the influence of contemporary biologists, or that Mendel was building on more than a century of plant breeding of peas, from Goss a hundred years earlier to Knight (who published many of the same experiments Mendel did fifty years before, but failed to count the numbers of his F2 progeny classes). Mendels pea experiments were part of a larger argument started in 1760 by Koelreuter and others concerning the origin of new species through hybridization. Henigs biography is good storytelling, but only medocre biology.